You hear a window breaking, someone isn't breathing, you've witnessed a serious car accident … you need help. Fortunately, pretty much everywhere in the United States, you can call 9-1-1 and be linked to an emergency communications center where you will be connected to the calm voice of a highly-trained professional who provides life-saving instruction and ensure that first responders arrive as quickly and safely as possible. The Central Dakota Communications Center (CenCom) is your local emergency communications center which operates 24 hours a day, seven days a week, and is responsible for answering all 9-1-1 and non-emergency calls. CenCom personnel dispatch law enforcement, fire, ambulance and other services. How busy is the Central Dakota Communications Center? 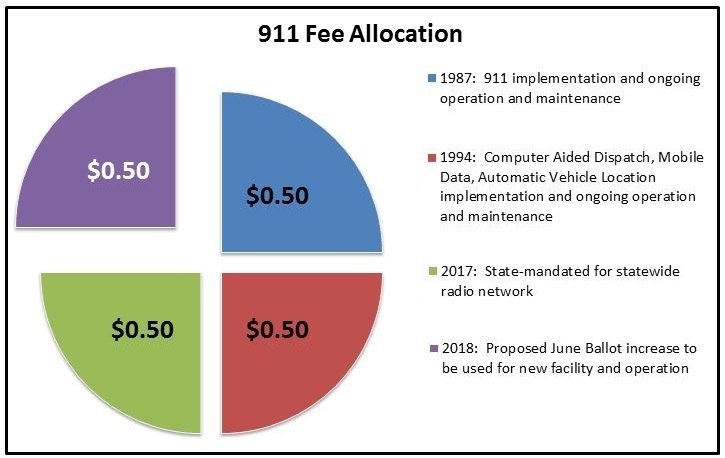 •	By a vote of County Electors, each household and business pays a $1 per month fee for 9-1-1 service on each telephone line that appears on their phone bill. 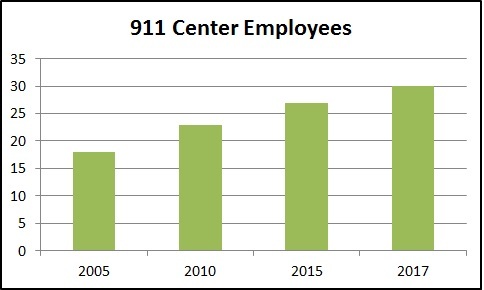 •	The North Dakota Century Code allows a 9-1-1 fee to be collected up to $1.50 per subscriber line. Burleigh County currently remains at $1.00. •	Additional funding for the overall operation comes from general funds of counties and cities. Burleigh County has authorized a ballot measure to increase the 9-1-1 fee "for the purpose of purchasing, leasing, or constructing and operating a new public safety communications center..." for the June 12th Primary Election. Why was the ballot measure authorized? CenCom has outgrown their current facility and is seeking a facility to meet operating needs now and into the future as well as being able to withstand man-made and natural disasters. In 2005 CenCom had 4 workstations and 18 total employees. Today, there are 8 workstations and 30 total employees, with a request to add 2 additional in 2019. There is no room for additional workstations. Currently, three supervisors are sharing one office. A fourth supervisor position is on hold until additional space is available. Calls for service have increased. In 2005, 15,810, 9-1-1 calls were received; in 2017, 35,622, 9-1-1 calls were received. Computer Aided Dispatch (CAD) events have increased. In 2005 there were 116,150 CAD events; in 2017, there were 201,095 CAD events. CAD events include 9-1-1 calls and dispatch and unit status tracking for all non-emergency incidents, alarms, traffic stops, etc. The proposed 9-1-1 fee is needed for a facility to meet staffing and operating needs and provide critical systems that will withstand man-made and natural disasters now and into the future.